Hope you all are in sukh sata. 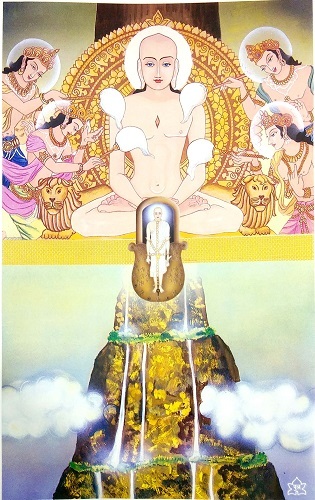 Today, on the second day of Das Lakshana Parva, let us learn about second Dharma i.e. Uttam Mardav. 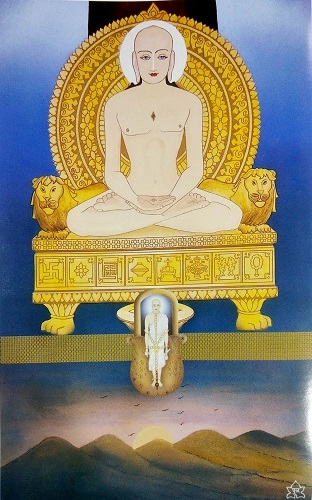 Uttam Mardava or Supreme Tenderness gets the second place amidst the ten tenets of Jainism. Compassion (Mardava) means to put an end to vanity or egotism. Two trees stood side by side in a forest. One was Banyan tree and the other Cane tree. Due to being big size, widespread and strong the Banyan tree developed vanity and egotism at heart. So it became proud. It said to the Cane tree, “What use is your life? You can provide neither shadow nor fruits nor flowers to anybody. Look at me. I provide shadow to so many creatures and even if somebody cuts me down beautiful coaches can be manufactured with my wood for sitting.” In a short while, the weather took such an ugly turn that the storm and rain both started together all of a sudden. In an instant, the Cane tree bent down and lay straight on the ground. But the storm saw that the Banyan tree stood erect and adamant. The storm uprooted this egotist tree and cast it away turning turtle. As a result, the vanity of the tree was shattered to pieces. Therefore, we should never be vain or proud of our safety. Just as sometimes our own weapon becomes the cause of self-destruction, likewise our vanity or egotism becomes the cause of our own ruin. Nobody likes to look with reverence at a person who is self-conceited and prides in his beauty, knowledge, strength, and affluence. People love gold because it is more smooth and full of luster than iron; they wear different types of ornaments molded from it and safeguard it. But nobody likes to wear ornaments of iron for being hard and without luster. Iron lies outside in the open bearing both the winter and cold and summer heat and ultimately destroyed by rust. Likewise, all people love those who are sweet tempered and they alone are safeguarded forever; but nobody likes the hard-hearted and harsh nature persons for they are of no avail. The noble-minded person who is not the least proud of ancestry, beauty, tribe, and clan, learning or education, penance, knowledge of scriptures and chastity is gifted with Supreme Tenderness or Uttama Mardava Dharma. Oh my God! I saw You with my inner eyes in the midst of several sages, saints, kings, herds and people from all walks of life. You were seated majestically in Samvasarana under the shadow of Ashokaviksha which is twelve times taller than you. Your golden appearance below the dark Ashoka tree made me feel like the golden edge of sunbeam shining on jet black clouds. 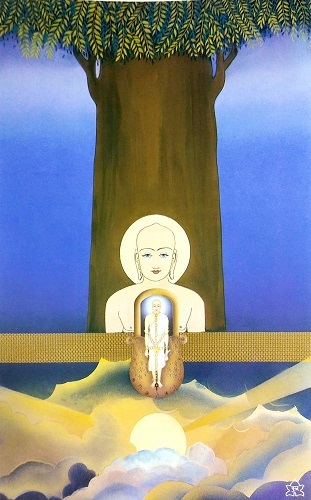 You seem magnification, under the Pratiharya of Ashoka tree. My voyage of concentration proceeds further and I see a golden throne of excellent workmanship and decorated with innumerable diamonds and precious stones. You, with your golden body, look entirely majestic while seated on the throne. Your halo spreads like sunbeams rising from behind the Udayachala mountain. God! The emittance of golden aura from yourself, sitting on a golden throne, may shower blessing on me and may bring the golden sunrise on my life! I saw your throne; it was a marvellous experience! I further saw during my voyage of concentration that the milky white Chamras looking like daisy flowers are slowly fanning the air on your golden body. An unforgettable experience! God, it looks as if the white streams are flowing from the top of Mount Meru, giving the cool and soothing effect like a rising moon. The whole sight is very very pleasing!